The accessibility/inclusion area for the community playground at Hylen Souders Elementary awaits resurfacing. Volunteers carry a triple slide to be installed at Hylen Souders Elementary School. More information about the playground project is available via the Souders Elementary PTO website, www.ptosouders.com. Sunbury Big Walnut Kiwanis can be reached at sbwkiwanis@gmail.com. An accessible community playground for children of all abilities is only days away from opening in the Big Walnut School District. Safety fence currently surrounds the new playground, which is behind Hylen Souders Elementary at 4121 Miller-Paul Road in Harlem Township. The new addition was placed in the asphalt adjacent to the existing 33-year-old playground and basketball equipment. 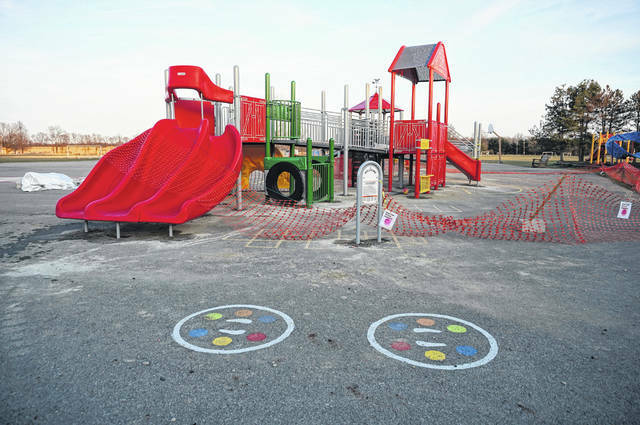 Next week, layers of rubber surfacing will be poured around the new equipment; and pending inspections, kids should be able to begin enjoying the new playground on April 15. Souders PTO member Amy Ranalli was inspired by her son, Marco, 5, who is finishing preschool at the elementary, and will continue to attend there through fourth grade. Marco is unable to lift himself, which means he can’t use the existing equipment. In September 2017, Ranalli approached the PTO, which was discussing replacing some of Souders’ old pieces. Along the way, Ranalli also asked the kid-friendly Sunbury Big Walnut Kiwanis for help, and she ended up becoming that fledgling service organization’s president. All told, the successful fundraising drive raised more than $130,000 in donations and grants. 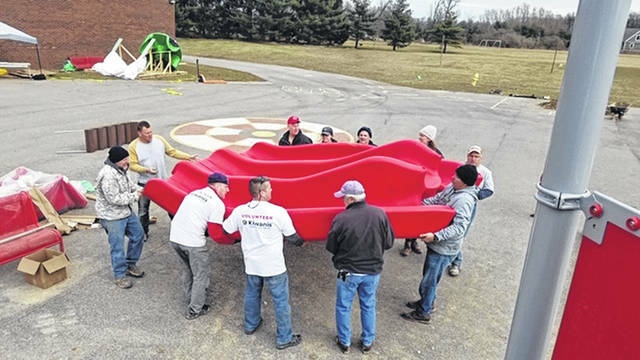 So with the help of more than 70 volunteers over nearly four days of four-season Ohio weather, the playground equipment was assembled and installed. The Little Tikes Commercial equipment was purchased from Bluegrass Recreational Products of Danville, Kentucky, which also designed the playground and supervised the volunteers. The community build shaved off at least $25,000 in labor. Marco and his friends will get to play on components such as a triple slide, double climbing wall and spinner (merry-go-round) with special features such as ramps, bucket seats, harnesses, and transfer stations so children of all abilities can safely use and enjoy it. The additional equipment should shorten wait times and encourage more cooperation.